Editors Note: This editorial from the Global Times, a nationalist Chinese media outlet that is said to reflect the opinions of the upper echelons of leadership in Beijing, provides a telling account of the Chinese perspective on the Snowden case, the nature of US-China relations, and Beijing's stance vis-à-vis unchecked US power more generally. US President Barack Obama has announced he will attend the G20 summit in St. Petersburg this September. A meeting between Russian and US defense and foreign ministers will also be scheduled for later this week in Washington. Although Obama canceled Wednesday his Moscow summit with Russian President Vladimir Putin ahead of the G20 summit, it is a relatively insignificant change. The US has apparently accepted the fact that Russia granted one-year asylum to National Security Agency leaker Edward Snowden. Russia has impressed the world, which views the Kremlin as the "winner" and the White House as the "loser." This judgment is correct. In the Snowden case, all the other countries involved have become winners while the US is the sole loser. Washington put on a show of bravado, but failed to extradite Snowden in the end. By contrast, Moscow displayed its national characteristics of decisiveness and boldness and kept Washington at bay. Many Chinese netizens believe China should have done so, but China only showed hesitation and weakness. 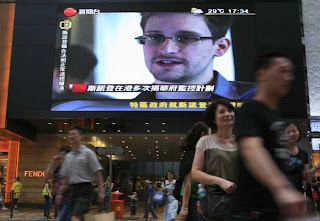 If China had Snowden in its care, a big change in its attitude toward Sino-US relations would have been brought and China would have had to undertake risks associated with such a change. Yet China ostensibly chose to not interfere. Now, the decision seems to have generated better results. Some of the US' hypocritical national policies were exposed, and Snowden was not extradited to the US. International opinion is scathing of the US in information security issues. At the same time, Sino-US relations have not been greatly affected. Moscow has consolidated its tough diplomatic attitude toward Washington and drawn closer in diplomatic status when a gap still exists in terms of the actual strength of the two. Moscow is willing to take the lead in the Snowden case and has experience in doing so. This perfectly fits Beijing's interests. Everyone knows the competition between China and the US is key to 21st century international relations. But China's strength still lags far behind that of the US. As China's comprehensive strategic partner, Russia took the initiative in the Snowden case and came to the forefront of the rivalry with the US, which shows multipolar flexibility in global geopolitics. Russia's action deserves respect from China. China is not willing to engage in a head-on confrontation with the US, but it has already had the ability to unite with those who can restrict the US' abuses of power. We did not confront the US directly, and this serves the long-term interests of China's diplomacy. This editorial appeared in the Global Times.